Sunday night brought WWE’s WrestleMania 34 pay-per-view with a monumental debut in sports entertainment. Former UFC Women’s Champion Ronda Rousey made a splash in her first-ever match which just so happened to be on “the grandest stage of them all.” Based on the reaction of the fans in New Orleans’ Mercedes-Benz Superdome her debut impressed and kept fans on the edge of their seats as she and Kurt Angle battled for a win. According to the ProWrestling website’s WrestleMania results, the tag team match featuring Rousey and Angle taking on Triple H and Stephanie McMahon lasted over 20 minutes during the second hour of the pay-per-view. “The Game” and his wife made a hot entrance as they had with last year’s Mania as this time the duo each rode their own motorcycle to the ring behind a trail of other bikers. They’d complete their arrival to the ring by both doing Triple H’s water spitting bit in unison as they stood on the apron. From there, the Olympic gold medalist Kurt Angle arrived out with fireworks going off behind him. Next up it was Rousey, who rocked the theme music she’s used since her first arrival at the Royal Rumble months ago. However, she was dressed for in-ring action as she sported a short skirt-like kilt and a Rousey athletic top. The four competitors would face off in the ring ahead of the bell with the heels using a few tactics from the get-go including Stephanie rushing over to yank Rousey to the mat from behind. The first part of the match told the heel story well as Stephanie stayed out of the ring and allowed her husband to gain control of Kurt Angle. Whenever Angle seemed to get an opportunity to head over for a tag, either Triple H or Stephanie would find a way to prevent it. However, there was one point where Hunter got knocked to the outside and wasn’t really moving to get back in. Stephanie yelled for him as Angle managed to finally crawl over and tag in Ronda, who was hungry to get her hands on Steph. Rousey would get the crowd going from there as she hit several big moves including an overhead toss to fling Stephanie across the ring. She also used her UFC-style rapid-fire punches on Steph in the corner to break her down even more. However, things would get mixed up when Ronda finally got a pinfall on Stephanie only to get yanked out of the ring by Triple H. That didn’t sit well with Ronda as she eventually was able to make it back into the ring and taunted “The Game” to step to her. At one point, Ronda was able to get the upper hand and hoisted Hunter on her shoulders in what looked to be her finisher. However, Steph was back in the ring again and helped pull him down. The heelish power duo took control of things a bit from there, as they eventually set up for a simultaneous Pedigree on Angle and Rousey. That backfired as Angle tossed HHH over the top rope, and Rousey eventually put Stephanie into an armbar submission. Rousey’s new boss struggled for a while to hold her off but Rousey used her strength and locked the hold on to make Steph instantly tap out. With that, Ronda Rousey enjoyed her first official debut match and first official victory within a WWE ring. Watching from the crowd was UFC president Dana White who was all smiles as he applauded his former fighter’s professional wrestling debut. Kurt Angle would hug Rousey after she went over to the crowd and then the pair walked off together backstage. Meanwhile, medical officials checked on Stephanie who the commentators speculated may have suffered a broken arm. 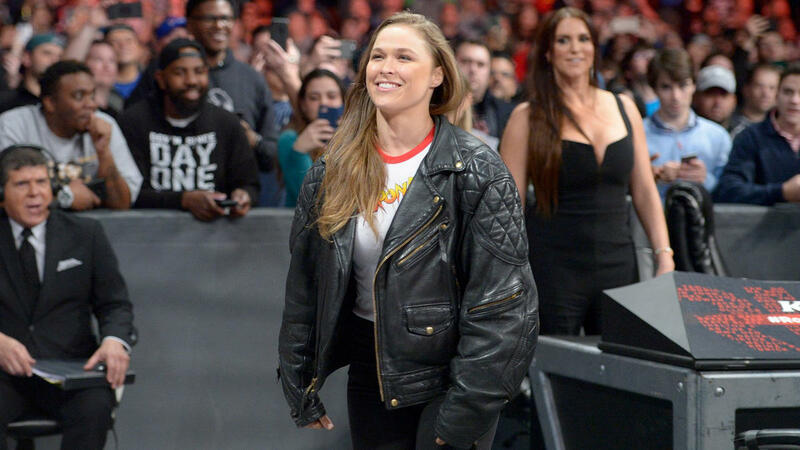 WWE fans certainly seemed entertained by Ronda Rousey’s big debut on “the grandest stage of them all.” However, one has to wonder what will be next for her pro wrestling career as she’ll need to have a singles match at some point.